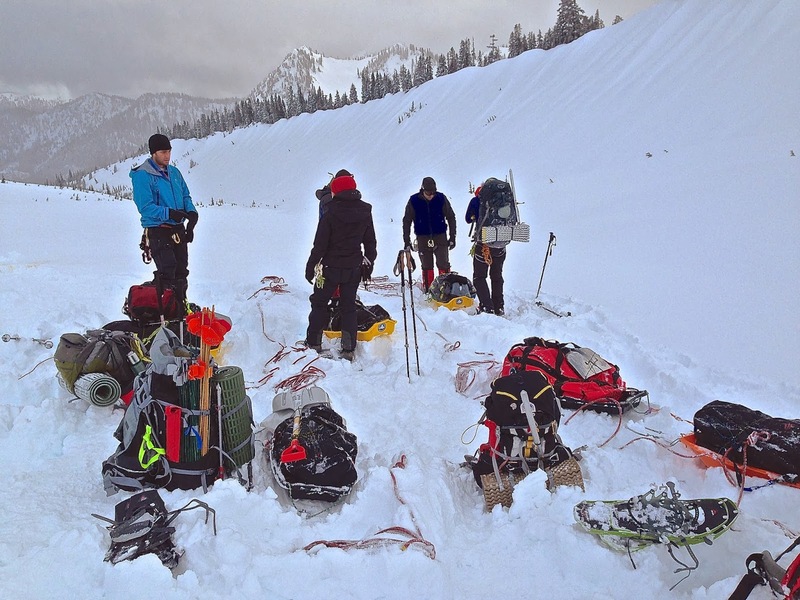 The majority of our programs at AAI deal with teaching technical skills or going on bigger expeditions. But we also realize that not everyone out there is ready to attempt a bigger objective right away. You've got to learn to crawl before you walk, and in our case, learn to walk before you climb. 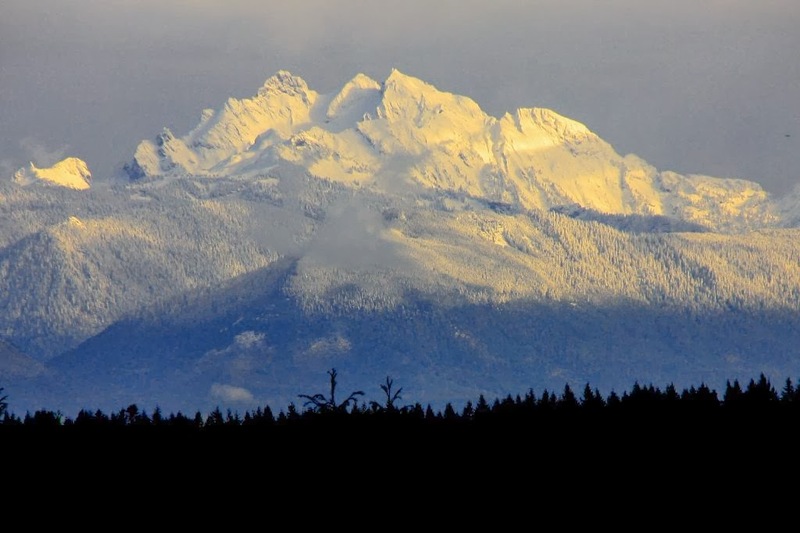 This is why we also offer a variety of introductory courses and backpacking trips through the North Cascades. 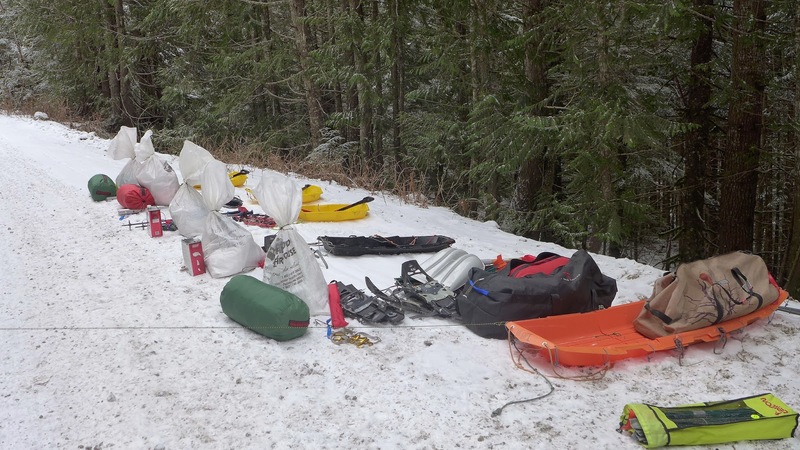 While enjoying the beautiful scenery that the area has to offer, we also teach you the basics of how to properly pack your pack, how to determine a good campsite. 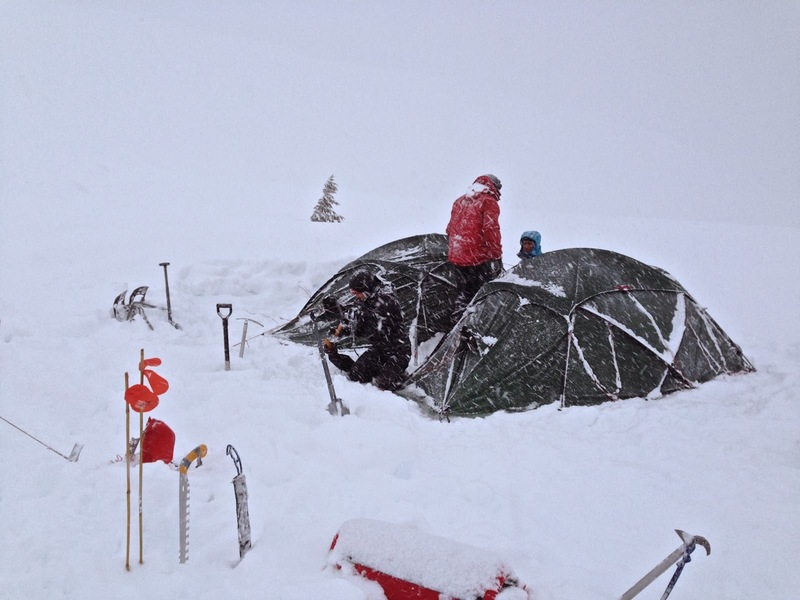 tips on backcountry cooking, and more. We offer a variety of objectives and trip lengths. 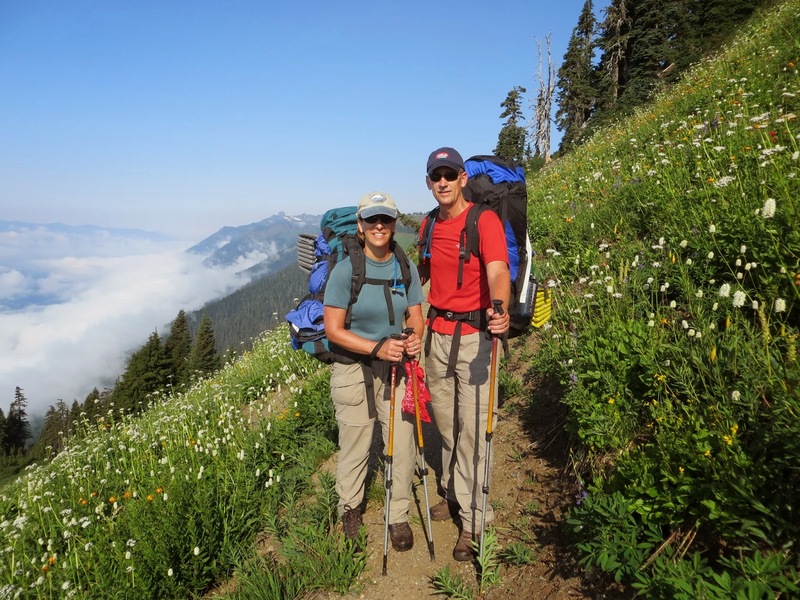 You can go to our North Cascades Backpacking page to see all the options available. And if you don't see something you like, we can come up with a customized trip for you. Below is just one of the options available. This this trip is 17-21 miles in length and is completed over 3 days. 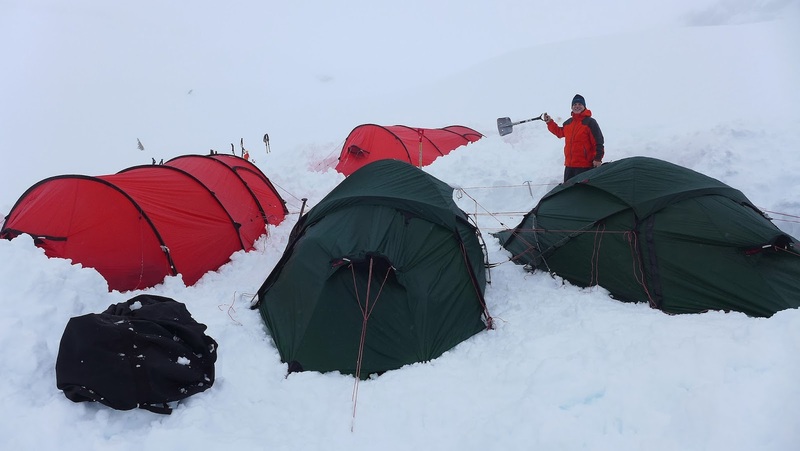 The route follows a high ridge with outstanding views of rugged, majestic peaks and snow covered glaciers. Day 1: You met in Fairhaven for a gear check by your guide. You will have an opportunity to rent or buy any needed gear. 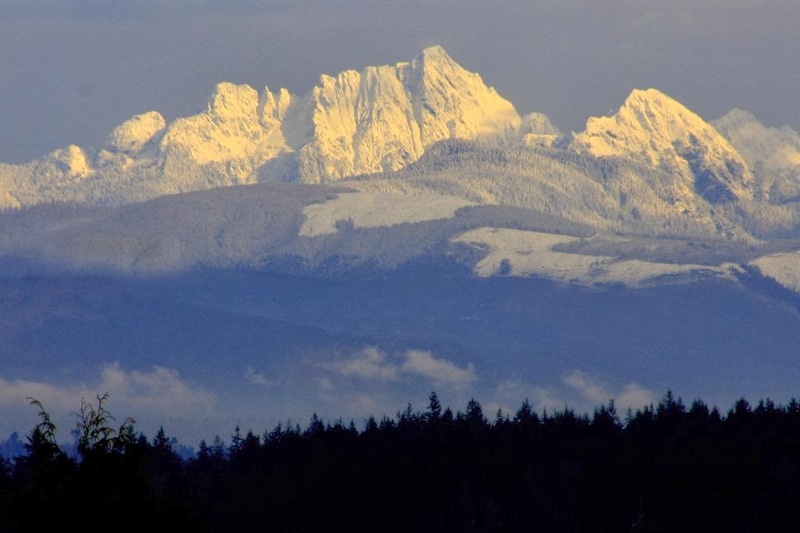 Then we drive up into the mountains to a pair of high alpine lakes for an optional 4 mile hike to a retired fire lookout with a spectacular panorama of the surrounding Cascade Mountains, including Mt Baker, Mt Shuksan and the Border peaks along the US - Canada border. At our nearby trailhead, we climb 1.5 miles to a small pass at timberline. We traverse fields of anemone, aster, paintbrush and fireweed while enjoying glacier carved rock formations. Expect to cross small snowfields if the trip is before mid-August and be amazed at vibrant fall colors in September, when the blueberries are delicious. Gaining the ridge, we can check out the high point of the mountain or dip our feet in one of the many ponds. wildflowers on the North Cascades trip. Day 2: You awake to the fresh smell of pines and the quiet peace of the mountains. Enjoy a nutritious mountain breakfast of scrambled eggs with fresh tomatoes and sour cream or oatmeal and blueberries. We get a leisurely start exploring the alpine plateau before starting our ridge walk. 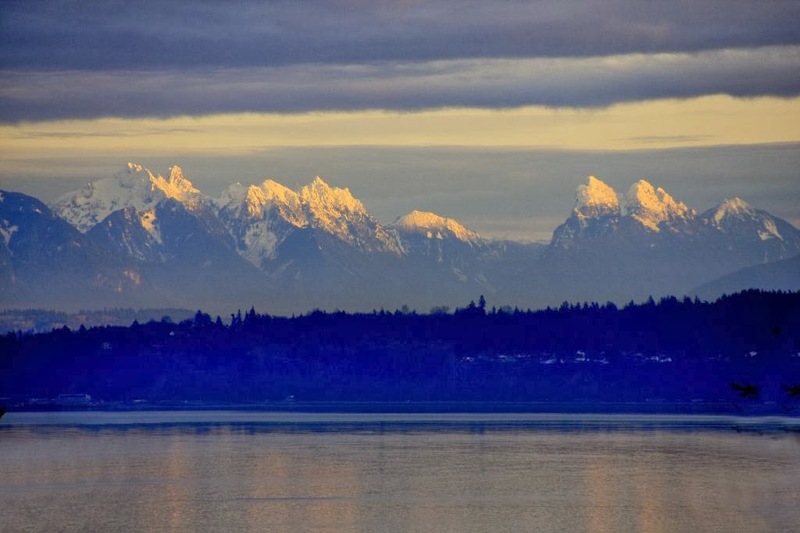 You will feel like you are in the Sound of Music on the open ridge surrounded by beautiful peaks and lakes. There will be plenty of time for singing, reflecting and taking in the scenery. We follow the ridge for several miles, stopping for lunch whenever we get hungry. There are many options for scenic campsites along the ridge today and we can stop early to enjoy the views. 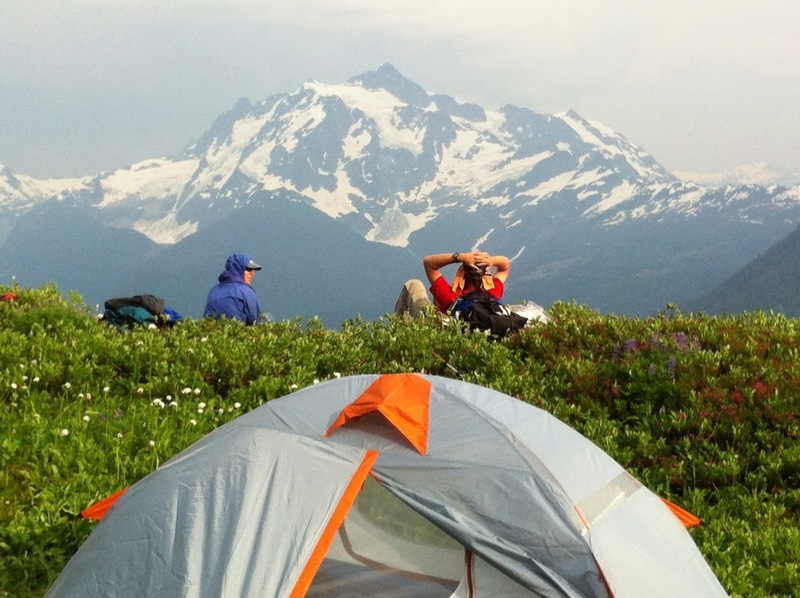 Relaxing at day 2 campsite admiring Mt Shuksan. Day 3: Continuing along the ridge, the views of Mt Baker change from the northeast face to the north and northeast flanks. Other mountains come into view as we follow a well maintained National Forest trail. We will have a chance to have lunch on top of Mt Excelsior before heading down into the forest and our ride back. 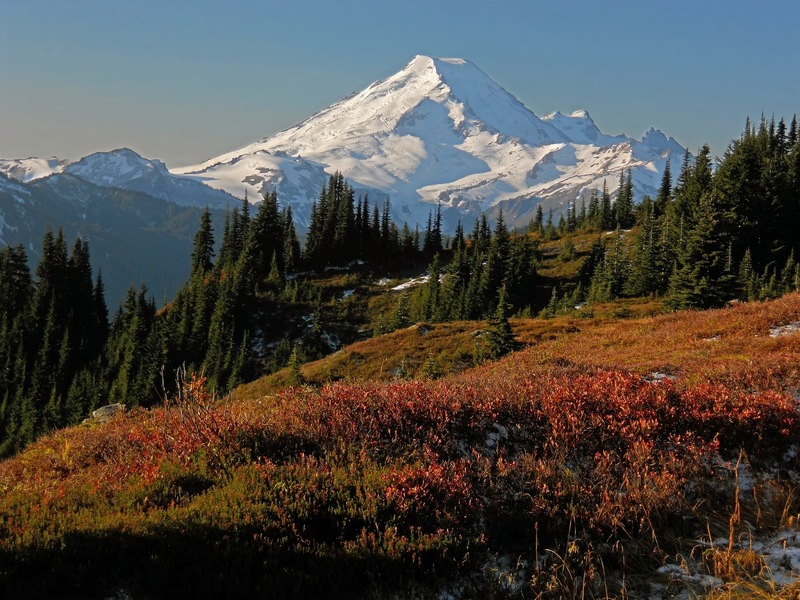 Mt Baker impresses the high ridge hiker over fall colors. Photos courtesy of Jeff Reis. Alex Honnold has cemented himself as one of best climbers in the world not just because of what he climbs, but how he climbs: solo. For Alex, soloing is the purest form of climbing: no ropes, no harnesses, no partners, no one to rely on. It is just himself and the rock (and now due to his fame, usually a camera-man or two...). We've seen Alex locked in a solid fist jam high above the deck, and as a fellow climber, I can say, "Ok, that's a solid hold. I can reason with this." But in his latest feat, Alex high on El Sendero Luminoso in El Potrero Chico, Mexico, and creeping along on tiny edges and crimpers! This video of his hardest solo yet will leave your palms sweating. Better chalk up before watching this. In keeping in the theme, you had better chalk up for his one as well. A couple of daredevils decided to hop the fence and climb the world's second highest building, the 650m tall Shanghi Tower, while it is still in the middle of being constructed! So these first two videos are enough to push the limits of a seasoned climber. But it is also interesting to take a step back and see how the average joe regards climbing. 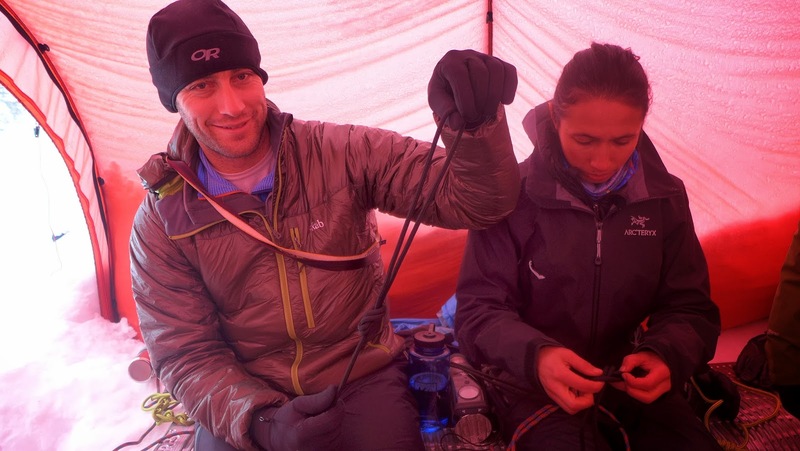 This clip is from a CBS piece on Tommy and Becca Caldwell and life on a portaledge. Climber's pick the right parking spot in J-Tree. Seth Hobby. Joshua Tree National park came to light as a real climbing destination decades after Yosemite climbers began to migrate there to avoid the snowy Sierra Winters in the late 1950s and 1960s. At the time, the Park was considered a great place to bide your time while bad weather kept you off the big walls; this attitude persisted through the early 1970s, when the first climbing J-Tree climbing guide was published. In the ensuing decades, the park has become a classic winter retreat for climbers of all abilities, and one of the most highly regarded climbing areas in the world. Visitors to the area are struck by the confluence of Southern California weather, convenient camping, and the high desert landscape, which combine in a breathtaking tableau worthy of time and exploration. the evening's last sun. Ted Ullman. From October through May, Joshua Tree’s balmy weather and vast climbing potential draw visitors from their tents out amidst the rock. Literally thousands of routes are scattered across the landscape of massive boulders and outcroppings, where vast potential for new routes still awaits the ambitious climber. Most of the rock features in the park that climbers favor are composed of crystalline quartzite, the granitic qualities of which turn steep, daunting faces into high-friction playgrounds. Impossible looking face climbs often turn out to be veritable walk-ups, and the intimidating shallow and flaring cracks of the Park turn out to offer reliably good gear placements for beginning and seasoned climbers alike. up a steep face. Katy Pfannnstein. With so much fantastic climbing to be done in one area, the benchmark for routes making the ‘tick-list’ is remarkably high. Dappled Mare, a 5.8 route on the Lost Horse Wall, makes the cut as one of our favorite routes in the entire park. The Lost Horse Wall is one of the largest features in the park, and is a great place to be on cooler winter days, with its Southwest orientation and afternoon sun. Dappled Mare is a full three pitches of excellent climbing, leaving the ground near the center of the formation. A healthy mix of mid-sized nuts and cams, up to 2.5”, will see you through several fun crack systems and some excellent face moves. A short walk off to the right will return you to the base of climb, and you'll be on your way to the next formation that catches your eye. while on lead. Dyan Padagas. If Joshua Tree sounds like an area you'd like to explore or a place you'd like to push the limits of your climbing, come down and join us for a course or a few days of private guiding this winter. With courses ranging from our intensive introductory course, Outdoor Rock Camp, to Learn to Lead courses for climbers looking to move into multi-pitch terrain, there’s no better way to push your climbing than joining us for some winter sun. 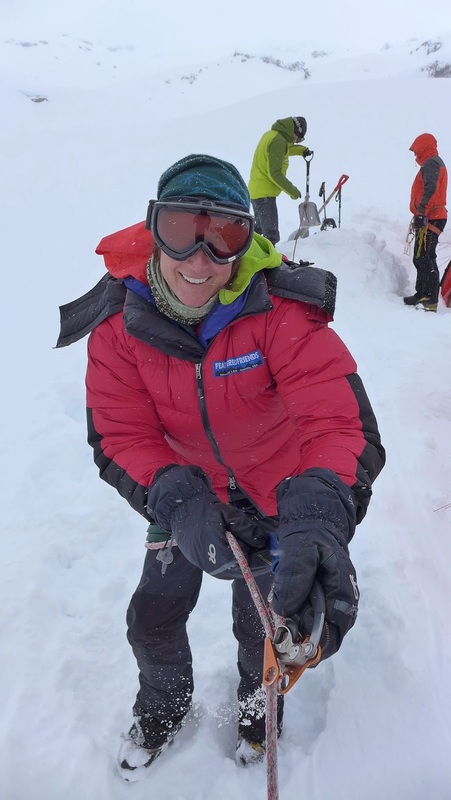 The last couple of weekends have been spent teaching avalanche courses for the American Alpine Institute. Although the snow pack has been a little boring, the weather has been great and it has made for some great courses. Below are a few photos of the last two trips. Early morning skiing in some nice light. Route finding and some wet surface conditions. Although most of the snow was pretty solid, Small areas of instability were found. Here we conduct compression tests on the snow. Failure layers in the first 20cm. A little route finding practice. South slopes with lots of sun showed evidence of recent slides. Skinning to find good snow. Good snow had been located.